Traffic. Just the mention of the word makes some city folk cringe, and for most everyone, it turns a good day into a bad one. It's a dreadful thing, and it's something that some people have to deal with on a daily basis. But technology has been coming to the rescue lately, with many personal navigation devices adding real-time traffic alerts to keep motorists from falling into nasty log-jams that are near impossible to escape. Google is a bit behind when it comes to that, but when the app is free, who could complain? 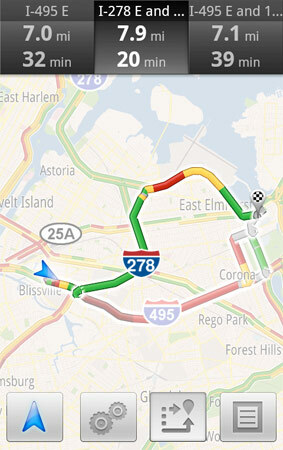 Google Maps 5.2.1 introduces a killer new feature: real-time traffic alerts. The new version of the app has the ability to route users around traffic, and with over 35 million miles driven by Google Maps Navigation users every single day, it should end up being quite effective. The traffic data is crowdsourced; if you're using Google Maps Navigation to get around, your velocity and location can be recorded and sent to show others in general how fast a given road is. You don’t have to do anything to be routed around traffic; just start Navigation like you normally would, either from the Navigation app or from within Google Maps. Before today, Navigation would choose whichever route was fastest, without taking current traffic conditions into account. It would also generate additional alternate directions, such as the shortest route or one that uses highways instead of side roads. Starting today, our routing algorithms will also apply our knowledge of current and historical traffic to select the fastest route from those alternates. That means that Navigation will automatically guide you along the best route given the current traffic conditions. Sounds like a total winner to us, and we hope it spreads to more navigation systems soon. Thanks again to Google for pushing competition.